Her home city of Belfast, Co. Antrim paid tribute to Voluntary Aid Detachment nurse Emma Duffin on International Women's Day 2017, unveiling a blue plaque at her former home on University Square, Belfast, Co. Antrim. 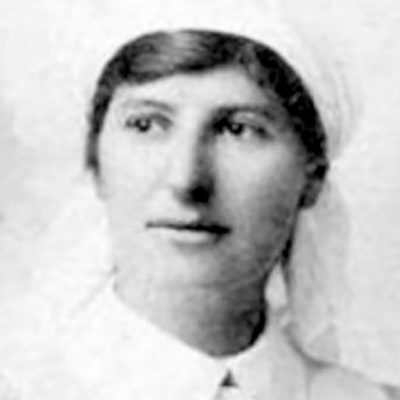 Emma Duffin served as a nurse during both World War One and World War Two. Born on 8th November 1883, she was the 4th daughter of Adam Duffin and Maria Duffin of 26 University Square, Belfast, Co. Antrim. The couple had 6 other daughters and 2 sons. The 1911 Irish census lists the family as Unitarian Presbyterians. Maria was born in 1854. She was a granddaughter of United Irishman William Drennan and lived to 99 years old. In 1906, she established the Belfast Charity Organisation. After 1919, this became the Belfast Council of Social Welfare. Adam was a well-known, respected stockbroker and businessman. He served in the first government of Northern Ireland as a Senator before his death in 1924. He was also the first Vice Chairman of the Belfast Charity Organisation. Emma’s education provided by a governess and several German Frauleins took place in the family home along with her sisters until she was 16 years old. She then studied at Cheltenham Ladies’ College, Gloucestershire, England. In 1903, she moved on Churchill College, Shrewsbury, England. A keen artist, she returned to Northern Ireland and attended Belfast Art College. Before the outbreak of World War One, she illustrated children’s’ books and poetry anthologies. Many of the stories came from the pen of her sister Ruth Duffin, while another sister, Celia Duffin, wrote poetry. In 1911, Emma spent a year working for the Van Bochen as a Governess in Pomerania, Germany. This helped her develop knowledge of German language and culture before the outbreak of the First World War. During the war, she enlisted as a nurse with the Voluntary Aid Detachment at the age of 31 years old. The Red Cross and St. John’s Ambulance formed the Voluntary Aid Detachment to provide support to troops. A further 2 of her sisters joined her in volunteering. The 2 Duffin brothers saw service as officers during the conflict. Throughout the Great War, she maintained a journal, detailing her work and the horrors she saw in battlefield hospitals. One night about the end of our first week I was told I was to go to a new ward. On the table was a bowl of disinfectant. I was told that this was a bad dysentery ward and that I was to disinfect my hands before I touched a patient. To my unaccustomed eyes all the patients seemed dying and I was suddenly struck by the terror of the whole thing. On the way out we had pictured ourselves nursing wounded only; we had never thought of illness somehow. Here was something the result of war, just as surely as any wounds and somehow it seemed even more terrible. Some of the patients looked more like skeletons as they sat up in bed in the dim light, rocking themselves backwards and forwards, groaning, grinding their teeth with agony. Her writing shows her caring nature and casts a humanitarian perspective on events. For 6 months between September 1915 and March 1916, she was in Alexandria, Egypt. There, she tended the wounded of the Gallipoli campaign. When the initial 6 months were up, Miss Duffin re-enlisted for a further 2 years. We had a patient in our ward, too, who had also been shot through the chest, a sergeant in the Inniskilling Fusiliers. He told me he had been in the Irish Rifles but had transferred because he fancied himself in a red coat. He had a red coat on now, one supplied by the Red Cross and night after night lay awake panting, but always patient. ‘Do you think, Sister, the Dr would give me something to make me sleep? Of course, just as you think best. I’m not too bad at all. I’ll maybe get off yet. I’ll be better soon’. Between April 1916 and November 1918, she served in military hospitals in Le Havre and Calais, France. There, she aided those wounded on the Western Front. Many of the injured men were too hurt to return by boat to Southampton. As well as Allied troops, she also cared for wounded German soldiers, speaking to them in fluent German. For her First World War service, she was Mentioned in Dispatches on 31st December 1918. The Germans lay on brown blankets, which gave them a neglected look. To a certain extent, they were neglected, too, for the staff was inadequate. It was a physical impossibility for me to wash all the helpless men. Enemies or not, they had terrible wounds and I hated to see them lying unwashed in the dirty brown blankets but I could not help it. One poor creature, shot through the stomach, was sick all night. During the air raid alarm I crept along in the dark to his bed several times but there was nothing I could do to ease him. He asked for a bit of cotton wool which he dipped continually into a bowl of water and sucked it. In the morning I made time to wash him myself, poor soul, I knew he would not be there to wash long. On returning after the war, Emma Duffin moved into the new family home at Dunowen, Cliftonville Road, Belfast, Co. Antrim. This house stood between the Misses’ Rentoul School for Ladies and Cliftonville Cricket Club. After her father’s death in 1924, the family moved to Summerhill, Stranmillis, Belfast, Co. Antrim. She became a member of the Belfast Council of Social Welfare committee. From 1933 onwards, she acted as Honorary Secretary in the organisation her parents helped to establish. She held this position until 1953 helping to highlight child poverty throughout the city. Between the wars, she noted a need for aftercare and started the Belfast Hospitals’ Aftercare Committee. She expressed a concern that this committre became a responsibility of the Stormont Government after the war. In 1937, she fought against male prejudice in the Council’s Housing Scheme. She insisted new housing should have “convenient kitchens” as well as “pleasing facades”. During this time, she also sponsored schemes for children in the city’s hospitals and public elementary schools. 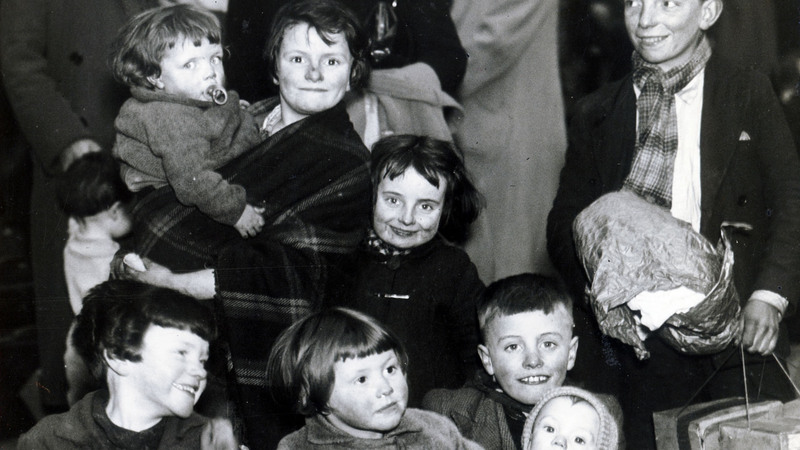 Belfast Telegraph / NMNI Photo Children evacuating Belfast, Co. Antrim from a railway station in the aftermath of the Belfast Blitz in April 1941. Copyright: Belfast Telegraph. After the outbreak of World War Two, in March 1940, Emma Duffin became a Commandant of the Voluntary Aid Detachment. She took charge of a group of over 100 volunteer nurses based at Stranmillis Military Hospital, Belfast, Co. Antrim. This building is now Stranmillis College. While there, she continued to write journals. Her records provide a detailed look at the events and aftermath of the Belfast Blitz in April and May 1941. In contrast to her work during the First World War, her writing describes a much more administrative role. I had seen many dead, but they had died in hospital beds, their eyes had been reverently closed, their hands crossed on their breasts; death had been glossed over, made decent. Here it was grotesque, repulsive, horrible. No attendant nurse had soothed the last moments of these victims; no gentle reverent hand had closed their eyes or crossed their hands. With tangled hair, staring eyes, clutching hands, contorted limbs, their grey-green faces covered with dust, they lay, bundled into the coffins, half-shrouded in rugs or blankets, or an occasional sheet, still wearing their dirty, torn twisted garments. Death should be dignified, peaceful; Hitler had made even death grotesque. I felt outraged, I should have felt sympathy, grief, but instead feelings of revulsion and disgust assailed me. In the aftermath of the Belfast Blitz, Emma travelled by foot to the top of the Oldpark Road, Belfast, Co. Antrim. Her writing describes the debris and destruction she encountered. Bombs had reduces houses to rubble and survivors searched through the wreckage for family and friends. Many others were fleeing the area and Emma, as a caring nurses, noted the dirt and lice on the children as they escaped the horrors of the city. Throughout the Second World War, Emma listened to news reports from the BBC on the wireless. Her knowledge of languages also permitted her to understand German and French broadcasts. 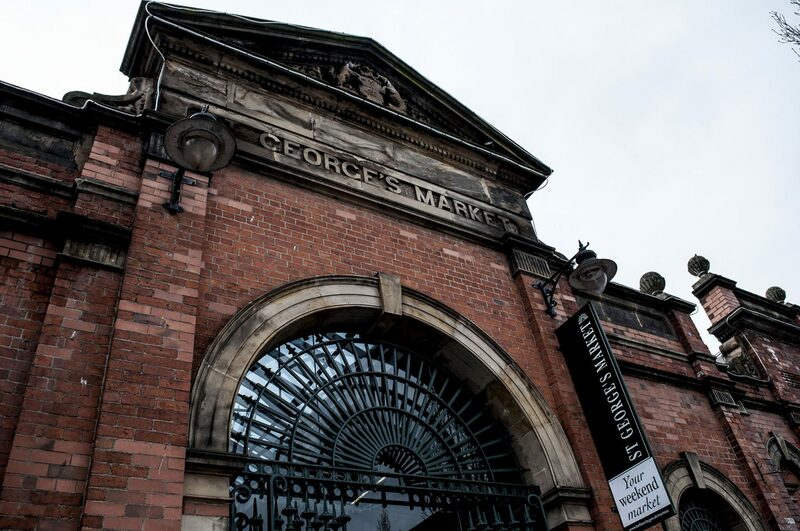 WartimeNI Photo: St. George's Market dates back to the 1890s and was the site of a temporary mortuary in the aftermath of the Belfast Blitz of 1941. Photo taken on 15th April 2016. Copyright Scott Edgar - WartimeNI. Although a very caring nurse, Emma was often outspoken when frustrated with wartime conditions. She wrote to Lady Mountbatten in protest over the military control of her Voluntary Aid Detachment unit. After moving from Stranmillis to a military hospital in Bangor, Co. Down, she noted the disgusting lodgings in the town. At this time, she expressed her thankfulness that she could stay with her sister in nearby Holywood, Co. Down. In 1954, Queen’s University, Belfast awarded her an Honorary MA. Professor E Estyn Evans presented the award, noting that it was rare for two sisters to be so honoured. Ruth Duffin had received an Honorary MA 11 years earlier. After spending her latter years at the family home Shimna, Newcastle, Co. Down, Emma Duffin died on 31st January 1979 aged 95 years old. Her grave is in St. Colman’s Cemetery, Newcastle, Co. Down next to her sisters Dorothea, Sylvia, and Celia. After her death, her diaries became part of a large Duffin family collection donated to Public Records Office of Northern Ireland. On International Women’s Day on 7th March 2017, Ulster History Circle unveiled a blue plaque for Emma Duffin. Great-nieces Emma Mackin and Sarah Bracher unveiled the plaque at her former University Square home. If you enjoyed this post on "Emma Duffin", please share with your friends and followers.